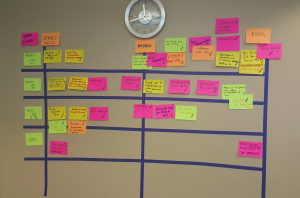 Our Practice team looks for creative ways to breathe life back into stale retrospectives. We love to embody techniques that require engagement from the WHOLE team, and prevent a few strong personalities from taking over the session. Teams get bored when they have run the sailboat six sprints in a row. They get even more bored when the cadence reverts to “what went well” and “what did not go well”. It’s easy for teams to go through the motions when retrospectives get boring, and our suite of retrospective techniques will definitely prevent boredom from creeping into your team’s mindset. This technique is a twist on the traditional “Happy, Mad, Sad, Glad” – and a technique we have dubbed “The Emotional Roller Coaster”. In our version of this technique, we have removed “Glad”, and replaced it with a Wildcard emotion. You can choose Overwhelmed, Furious, Ecstatic, etc..the possibilities are truly limitless. We have found that “Happy” and “Glad” are often interchangeable, and teams like the ability to customize emotions. This can often lend itself to some funny descriptions, and helps the team feel like they can share ANY feeling without having to paint it in the light of the original four. 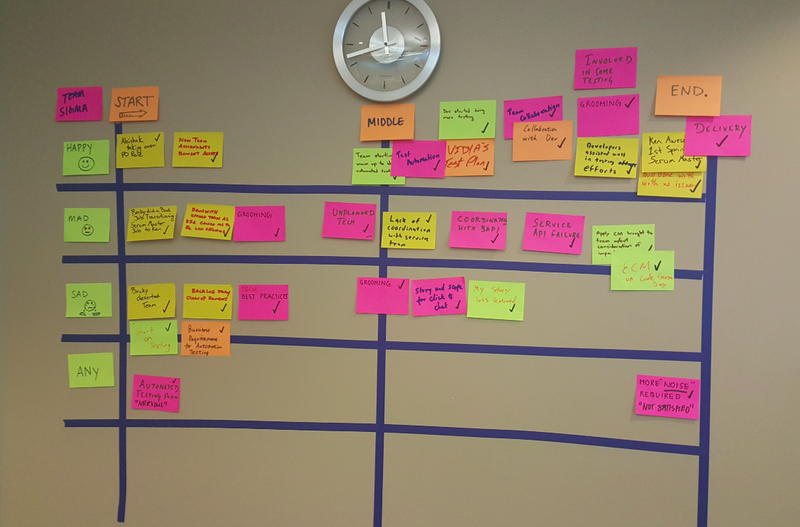 We incorporate a sprint timeline, allowing people to express multiple emotions, on the same topic, throughout the sprint. This helps to frame a point-in-time where the emotion was first felt, and gives team members the approval to feel upset about something in the beginning of the sprint, while still arriving at a positive conclusion by the end of the sprint. It also helps team members look through the context of someone else’s feelings – as an item that was unemotional for one team member, could have derailed another team’s member day. Understanding how to perceive an event through the eyes of someone else can be especially enlightening. This technique also allows a coach or scrum master to see if the sprint ended on a positive note. I always put “Happy” at the top, and look to see how many cards get placed in that category at the “End”. If I see a lack of cards in “Happy”, it helps to prompt a discussion on “change”. This exercise is best used for teams that have conflict either personally with each other, or with another team they work with. We try to coach that conflict is good, as its typically required for growth. The minute teams stop caring and lose passion, is the point where we want to evaluate if they are really taking risks, and introducing discomfort. Change is inherently difficult, which is why we like to be transparent and accepting of the gamut of emotions people may feel throughout a sprint. 1 min – Demonstrate spatially, the sprint timeline: The Beginning of the sprint (day 1), the middle of the sprint, and the end of the sprint (today). Team members can enter events across the continuum, or focus on a certain point in the sprint – their choice. 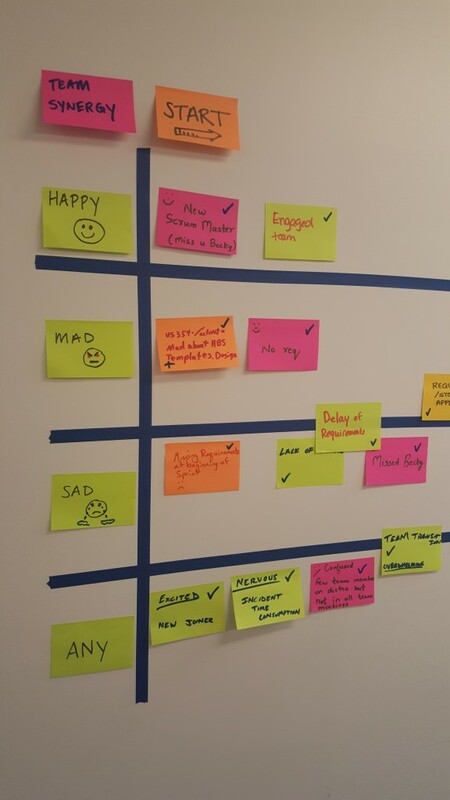 2 min – The sprint timeline will then be divided into 4 quadrants: Happy, Mad, Sad, and Wildcard. Team members are encouraged to express how a particular event made them feel. The Wildcard emotion can be ANYTHTING. They just have to list it on the card. 30-35 min – Review the cards in the order they appear on the sprint timeline. Encourage people to talk about the emotion behind the card. What specific events or outcomes led them to that emotion? Was there something that could have been done differently from their perspective? If the emotion was a positive one, how can we replicate the outcome or feeling? 5 min – After all cards are reviewed , hand out stickers / pens / whatever – to allow team members to AGREE with a specific card or set of cards. We want to promote consensus, and not violate our first rule: no judgment permitted. Each person gets 3 votes of something they AGREE with. 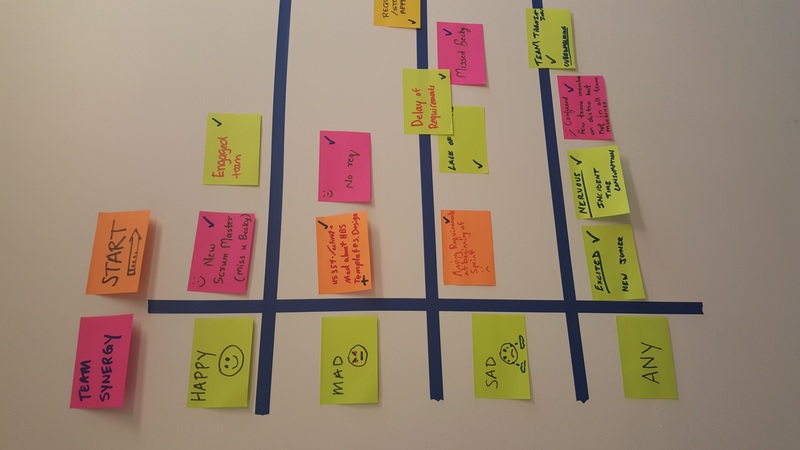 20 min – Review team member votes, and organize the following: What emotion was most prevalent for the team throughout the sprint? Were there any surprises? Were alternatives present that people were unaware of at the time the event occurred? Can we commit to handling things differently when similar issues come up? What is within our team’s control to change? SAVE these discussions. Hold the team accountable to helping each other through conflict. Sometimes it’s the little things, like acknowledging help, saying thanks, or simply just letting people vent when they get upset about something. Encouraging an emotional response, is different than letting people whine and complain. Teams with Healthy Emotional Quotients (EQ) tend to deliver higher value, than teams that don’t. Jason Cusack is an Enterprise Agile Coach, and has held roles as a Scrum Master, Product Owner, and Corporate Bureaucracy Destroyer. For questions, comments, or feedback, please contact Jason on twitter @scrumjitsu.